Steve Madden's Rusttik boot has rocker chic style in the bag. Get yours in black or brown for $149.95 at Endless.com. On a tight budget? 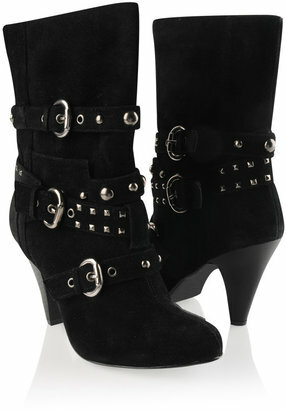 Try these Studded Suedette Boots ($29.80, forever21.com) for the same look, less money. Click the image to purchase. I have the F21 ones! They're pretty comfy and look great for toughening up outfits. I have the Steve Maddens, which I got on sale for 40% and be warned they feel higher than they look! It's worth it though for that level of fabulousness.